I’ve long been a huge fan of the cloud-based practice management services, even though I have been critical of their offerings. It’s criticism offered with love, because I don’t need any proof that they’re working to improve their products. With enterprise products like Pro Law or Amicus Attorney, you have to wait for the next version before you know whether your criticism has actually been heard. With the cloud-based services, the response to your criticism may be just an update away. One area that all of the cloud services have recognized has been providing mobile access to their services. Clio has a phenomenal iPhone (and now Android) app, but it’s designed for the phone. While it has some features that I do like on my iPad, in reality, I’m better off using the web version (which is totally fine!). Rocket Matter, on the other hand, has decided to take advantage of the unique platform opportunities offered by the iPad, and customized an app taking full advantage of it. Recognizing that the major advantage that a tablet has over a smartphone is size, the Rocket Matter app has created a platform that provides a ton of information on one screen – which couldn’t be done effectively on a phone – while making sure it remains optimized for a touch-screen system that, despite its strengths, just isn’t the same as your desktop computer. Law practice management on the go. First, I should make this clear: this is NOT a fully-functioning, independent practice management system. This app is intended to be used as a mobile component for your Rocket Matter platform. 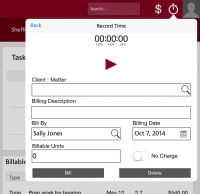 Items such as administrative tools and trust accounting are not accessible on the mobile app. The app is phenomenally successful at what it sets out to be – a mobile companion – regardless whether inclusion of such features are intended in the future. If you’re a Rocket Matter user, this app will make Rocket Matter even more useful. If you’re thinking about subscribing, I would strongly recommend asking whether your preferred mobile platform is your iPad or your smartphone. Personally, I elected to get an iPad without cellular connectivity (because I ran out of gold bars). As such, the iPad app is less useful to me than an iPhone app. However, if you’re an avid mobile iPad user, Rocket Matter probably just made itself considerably more attractive as an option with this app. 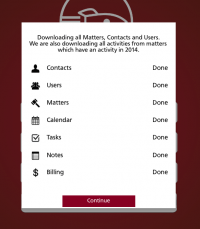 This app is your mobile version of your Rocket Matter practice management system. Right off the bat, the app downloads your Rocket Matter data for contacts, matters, calendar, tasks, notes, and selected billing information. All of that information is now a part of your Rocket Matter app, immediately accessible even without an internet connection. 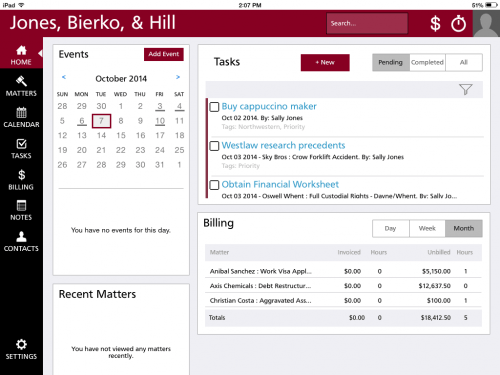 The main screen contains links for your matters, calendar, tasks, notes, contacts, and general billing information. Also on every screen is a quick link button to enter time on a matter and to enter expenses for a matter. The home screen is your day-planner, complete with a list of events, upcoming tasks, billing information, and a list of your most recently viewed matters. The screen is elegantly put together, and takes full advantage of the iPad’s screen size to give you a complete look at your day or week. Crucially, one of the things this app really does well is utilize the space available on the screen to provide as much information as possible, without inundating the user with information that simply isn’t important. This elegant use of space is definitely something that sets it apart from apps designed for use primarily on a smartphone. Click on the matters tab, and a list of currently open matters, including the name of your client, the current ledger balance, and current trust balance of each case appears. As I discussed in my review of Rocket Matter last year, one of the things RM does exceedingly well is help small firms manage the accounting aspect of the practice, and it’s nice to see that Rocket Matter plays to its strengths by including accounting information here. Open an individual matter, and you see upcoming tasks, calendar events, and a quick look at the accounting status of the case. 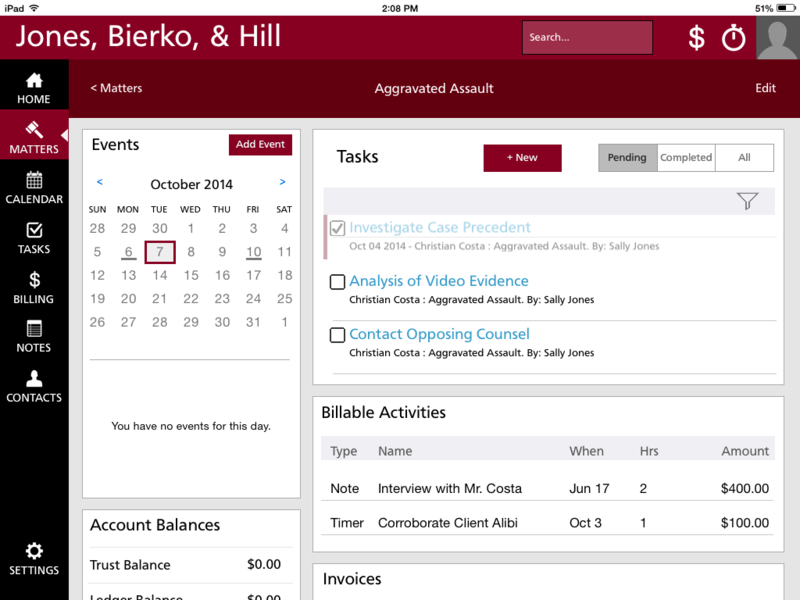 Also available from the individual matter screen, you can add case-specific calendar entries, tasks, or case notes, and review or edit entries already made in any of those areas. Scroll down, and you get a list of contacts for the case, including their specific designation. The overall task list and calendar pages are exactly what you would expect. View calendar for the day, week or month. The task list shows your current tasks, with helpful color indicators – no color means it’s due in the future, orange indicates it’s due today, and red indicates that you’re late! I particularly like the contacts screen (not surprisingly at this point due to its effective use of screen space!) 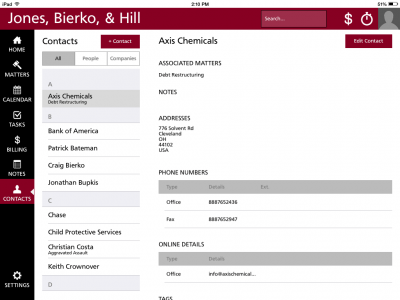 On the left, you have a column with your contacts, which can be sorted for people, companies, or all contacts. Then, on the right, you have the details for individual contacts. This would not be possible with a smartphone screen. Two other elements of the app, which don’t deal directly with the app’s law practice management features directly, bear discussion. First is the ability to customize the look of your screen. For anyone who was at the 2014 Clio Cloud Conference, you know that among their changes was a modification of their distinctive (but ugly, IMHO) mustard yellow color to a new, much more elegant (almost) Carolina Blue. However, their iPhone app remains mustard yellow. Rocket Matter, perhaps taking a hint, has decided to make your app customizable, offering several different colors, and even a cool (nerdy) avatar image. 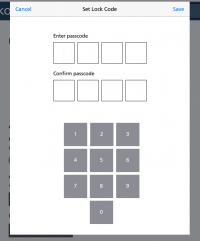 The second element is the availability of a keycode lock for the app. Although the app indicates that the use of this keycode is intended to be in place of your login and password, my iPad stores that information automatically. That means anyone with access to my iPad would have access to potentially confidential client information. If you paid ANY attention to my lecture on BYOD security, you know that an extra passcode lock on your confidential information should be automatically required. This feature MUST be used! The App: Rocket Matter for iPad. Price: Free (requires Rocket Matter subscription). Key Feature: Really, to be honest, everything. In my opinion, Rocket Matter could use their app as a road map for redesigning some of their web version to make case information more accessible. Fatal Flaw: None – this app does what it sets out to do. There are some things that you’re not able to do with the app that are available on the desktop version, but this app is meant to be a mobile companion system, not a standalone practice management platform (yet). Next Step: You gotta keep up with the Joneses. I can see Rocket Matter progressively adding accounting features as a viable next step. If you’re looking for cloud-based law practice management, I would always advise you to look around at all the options, and utilize the free trials they offer. However, if you’re someone who relies heavily on your iPad when you’re on the go, you’re going to have a hard time beating Rocket Matter’s new app for case management information. As a side note, I couldn’t be happier that Clio, Rocket Matter, and MyCase are giving each other such a great run to produce better products. The frequent updates and upgrades, as well as the responsiveness to user requests, is amazing out of these three companies, and it’s what you see when there is true competition in an industry. Here’s hoping this continues into the foreseeable future, without the stagnation that arises when one company becomes the dominant player, and no longer needs to be responsive to the requests of its users!